Brooklyn Nine-Nine fans are angry that the popular show is coming to an end, calling the move a “mistake”. Fox says the final episode of the fifth and final season will air later this month. Cast members have thanked fans for an outpouring of support following the show’s cancellation, which was reportedly due to a drop in ratings. Celebrities like Lin-Manuel Miranda have joined calls on social media for the show to be renewed. The show, which developed a cult following after launching in September 2013, has been praised for its “intersectional representation” and “inclusive humour”. It stars Andy Samberg and Andre Braugher, and follows a team of detectives in the New York City Police Department. Online reaction to the news ranged from shock to disappointment. Many fans are hoping another network might pick the show up. Celebrities have also tweeted their support, including the Backstreet Boys and Lin-Manuel Miranda. Melissa Fumero, who plays Amy Santiago, said starring in the show had been a “huge honour”. Terry Crews, who plays Terry Jeffords, and Joe Lo Truglio also tweeted their reactions. 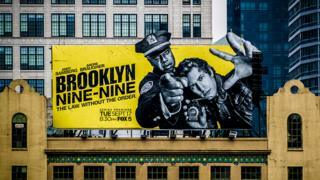 Brooklyn Nine-Nine is the second longest-running live action Fox comedy after New Girl. Despite a 100% critics’ rating on Rotten Tomatoes, as well as a 95% audience score, there were rumours that its network ratings were sliding. The series finale will air on 20 May in the US. E4 is still airing the remainder of the fifth season in the UK.